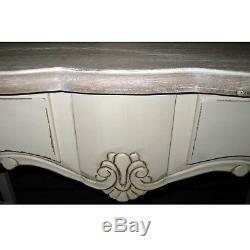 Charming French style Shabby Chic style furniture finished in distressed Antique Cream. With delicate carvings and painted metal handles. Made with Pine carcases and drawer fronts, composite panels/drawer bottoms/backs and veneered Paulownia wood tops finished with an aged lime wax effect. Paulownia and Pine are a sustainable resource and strong but these items are not as heavy as items. Made using Mahogany or Oak. Example pictures above - these are for reference distressing varies from piece to piece. Brand New In Original Box. In order to give better service we check most items prior to dispatch. Colour may vary due to lighting conditions when photographed. All prices include Vat at the current rate. Free p&p for all additional eligible items Add your items to your basket to receive postal discount. Please feel free to browse our shop for other items. Add our shop to your favourites list and sign up to our newsletter for new listings and special promotions. HIGHLANDS/ISLANDS OF SCOTLAND, OUTLYING AREAS & NORTHERN IRELAND DELIVERIES. Deliveries to outlying areas may take a little longer. We know the rates to these areas are excessive on the small items but our contract is with DPD who apply this surcharge. All postcodes containing GY and JE. TR21 thru TR25 inclusive (only). AB36-38, AB55-56, FK17-21, HS, IV, KA27-28, KW1-14, KW15-99, PA20-99, PH19-99, ZE. INTERNATIONAL DELIVERIES: PLEASE PROVIDE A CONTACT NUMBER. Our postal rates/services are for UK MAINLAND ONLY - We deliver to Europe (see exclusions). If you require an alternative address after ordering we will need to cancel your order and advise to re-order with preferred address selected. The company has been dealing in quality contemporary and reproduction items for over 25 years. It is company policy to use recycled materials to pack your items wherever possible. We have invested in a cardboard shredding machine which reduces greatly the need for man made cushioning. After checking your items please recycle as much as you can. 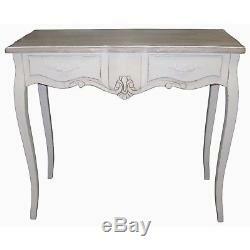 The item "SHABBY CHIC SIDE/DRESSING TABLE 2 DRAWER LOIRE FRENCH STYLE ANTIQUE CREAM" is in sale since Wednesday, March 06, 2013. This item is in the category "Home, Furniture & DIY\Furniture\Tables\Other Tables". The seller is "middle-england" and is located in Birmingham. This item can be shipped to United Kingdom.